Touch down in Bangkok, discover colorful Yangon and sail on Inle Lake. Explore Mandalay and let Bagan surprise you with its pagodas. Hanoi will charm you before finding tranquillity on iconic Ha Long Bay. Open your eyes to traditions in Luang Prabang before exploring the Angkor Wat complex in Siem Reap. Finally, the beaches of Sihanoukville provide a relaxing end to your adventure. 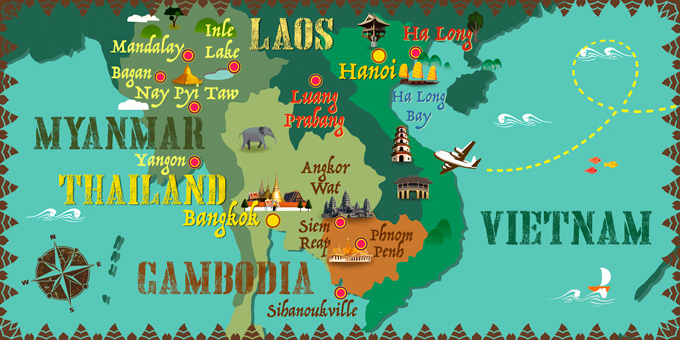 International flights: US - Bangkok ; Phnom Penh - US. *** Possibility of booking optional excursions in the next step of the booking. Please note that all additional optional excursions which are not selected at time of booking must be requested before final payment is made at least 30 days before departure. *Visa arrangements for Myanmar. Through the government website (https://evisa.moip.gov.mm): $50 per person by credit card payment. Arrive at your US departure airport ready to board your flight to Bangkok. Night on board. Breakfast at the hotel. Set off towards Bagan via Nay Pyi Taw, the modern capital of Myanmar. Be enchanted by the tiered roofs that crown the buildings of the Parliament complex and admire the golden Uppatasanti Pagoda. Continue to Bagan, an ancient city, on the banks of the Ayeyarwady River. Arrive, transfer to the hotel and overnight stay in Bagan. This morning take part in a very special dawn visit to watch the monks collecting the alms. As the sun begins to rise, long lines of orange-robed monks leave their pagodas and collecting offerings from Luang Prabang residents. It is a beautiful, serene ceremony that highlights the spiritualism of the Laos people. Visit Morning Market where you can fresh local produce. Return to your hotel for breakfast then board a cruise upstream on the Mekong River, for a beautiful view of the tranquil countryside as well as an interesting visit to the mysterious of Pak Ou Caves, crammed with thousands of golden Buddha statues of various shapes and sizes. Return to the town at noon time. In the afternoon, visit the National Museum at the former Royal Palace, which displays a lovely collection of the artefacts reflecting the richness of Lao culture dating from the days of the early kings right through the last sovereign. Visit the impressive stupa of Wat Mai and the magnificent Wat Xieng Thong, then climb up to the top of Phousi Mount for an enjoyable exploration of the sacred, gilded stupa as well as a beautiful sunset view of the city and the Mekong River. Later, explore Street Night Bazaar, where you can find handmade textiles by local and hill tribe people. Overnight in Luang Prabang. Breakfast at the hotel. At the indicated time, transfer to Phnom Penh airport for your flight back to the US. Arrive in the US and end your trip. Passport with a minimum of six months validity. One blank page for stamp. Visa is required before entering. Visa on arrival. Valid for one month after entry. 220 V. European and U.S. plugs. There are no mandatory vaccinations for travellers from U.S. Check with your doctor. Must apply for visa one month prior to arrival. There are no mandatory vaccinations for travellers from U.S. countries. Check with your doctor. A visa is issued on arrival for stays of up to 30 days. Price $35. Breakfast at the hotel. At the indicated time, transfer to Phnom Penh airport for your flight back to the UK. Arrive in the US and end your trip.